Created using Fall 2018 English Language Arts Item Specifications. Includes progression of ALL Reading Informational Standards and Reading Literature Standards. Students can write their initial attempt on an assessment and second attempt after reteaching or intervention. Key vocabulary is pulled from each standard and emphasized on the right of each level. 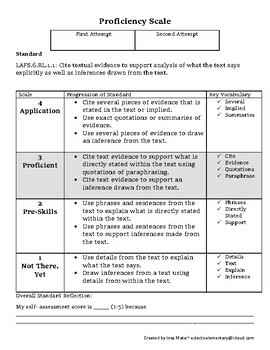 When you have completed a standard, there is a space at the bottom of the page for your students to evaluate and reflect on their final understanding of the standard. 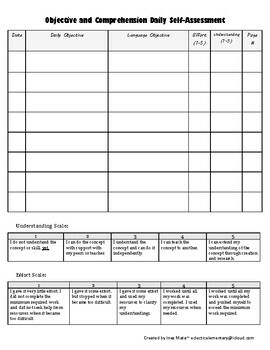 The back page of each Proficiency Scale allows space for each student to write their daily objective aligning to their particular level within the standard. Every day your students can evaluate their understanding of the daily objective and effort level towards mastery of the daily objective. 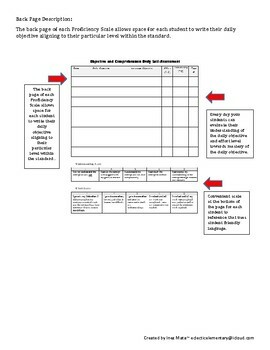 Convenient scale at the bottom of the page for each student to reference that uses student friendly language. 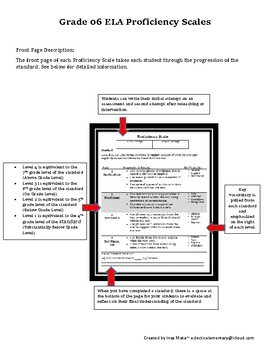 ** Working on Grades 2-8th Grade ELA Proficiency Scales to be posted in store soon. If you need a particular grade level, please let me know.